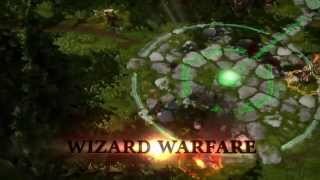 Magicka: Wizard Wars - register and play! Magicka: Wizard Wars - updated dynamic MOBA (PVP Arena), where you act as a sorcerer of the elements. But first things first. To enter the game you need a Steam account, as well as a game client. Use an existing one, or Magicka: Wizard Wars registration is required. Further in the Steam launcher we find our game and download it. training session (you hone your magic skills on a small map).
. These are your basic skills, which you can combine to attack, defend and impose improvements on your magic. All this happens when you press the keys assigned to each element. So, a shield + earth + earth will give you stone armor from physical damage, and, for example, fire + earth + earth - a fire ball with great damage. Shield + death - will lay four bombs that explode in a couple of seconds and cause damage in radius. Consider that during the game your skills, whether attacking or healing, will affect both your allies and your enemies - be careful! Please note that every magician has its own development branch (after each battle you earn points and spend them on your character’s skills), each branch gives bonuses to a certain element and weakens another one. Use this knowledge on the battlefield and you will be harder to win. Each Magicka Magicka: Wizard Wars has four ultimate skills that take time to recover after use. Two skills that will give strength and two skills that will cause great damage (by area or single target). In the latter case, the damage can be applied to yourself. Each magician has slots for clothes, each of which gives bonuses either to the magician itself or to certain elements. Proper combination will allow you to own one or another element at 100 percent. But do not forget, improving one element, you weaken another. Magic weapon - deals physical damage, and also has a physical combat technique (while holding the right button). Each weapon has this technique. After playing a couple of hours in Magicka: Wizard Wars, you realize that the toy is addictive. Dynamic battles give it charm (one fight last no more than 20 minutes). A humble set of magic at the same time turns out to be very diverse and in each battle you will learn something new. If you are a fan of dynamic battles, then this game will seem like a breath of fresh air among other moba games!